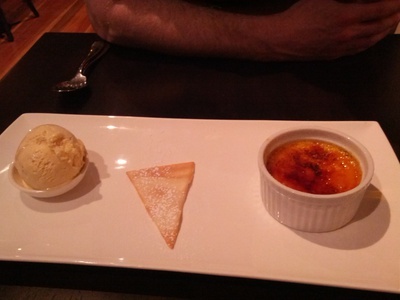 Being the insouciant bon vivant that I am, a man-about-town if you will, I have been able to sample a number of desserts in Melbourne's inner west. Some have risen to dizzy heights, while others have been disappointingly mediocre despite sounding delicious on the menu. As I tend to do on this 'ere website I've decided to focus on the positive experience and consign the less impressive efforts to anonymity (rather than naming and shaming). Or to give it its full title the 'Vanilla Bean and Lemon Crème Brulee with Fresh Tuille Biscuit' this dessert is an impressive effort from The Strand Restaurant. The layer of sugar on top cracks like glass and the citric bitterness provided by the lemon combines beautifully with the silkiest of sweet custards. The ever reliable scoop of vanilla ice cream and the crunchy wafer like tuille biscuit round out the course. A fine way to cap off a luxurious night at one of Williamstown's finest restaurants. 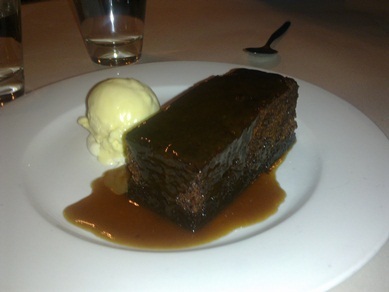 Soft and moist with just the right sweetness in the sticky sauce, this is a cracking pudding to have in the depths of winter next to the Prince Albert's fireplace - or indeed in the height of summer in the Prince Albert's courtyard. Portion size is perfect given the richness of the dessert and the scoop of common-garden-variety vanilla ice cream on the side is all that's required with the quality of the pud. Sticky date, Prince Albert. You do the double entendre. Chocolate and strawberries were simply made to be together so, despite L'uccellino offering a number of tantalising sounding desserts (including a Peach and White Chocolate Pizza Dolcie and a Calzonicino with banana & cream paticciera) I found it impossible to pass up the Dark Chocolate and Strawberry Pizza Dolcie option. A flaky pizza base with rich melting dark chocolate, topped with lush strawberries is an impeccable effort from this pizzeria. 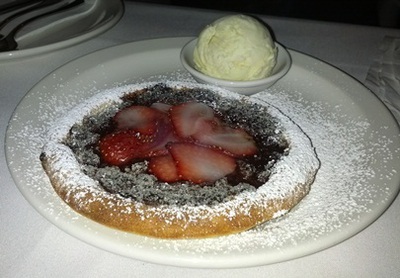 The icing sugar dusting tempers the bitter chocolate and tart berries exceptionally well. Once again a simple vanilla ice cream caps off this dessert. Impossible not to love this one. I would recommend you get to these venues and try these desserts – absolutely nothing wrong with the mains at these locales however the sweet course is what makes us all sigh in postprandial delight.